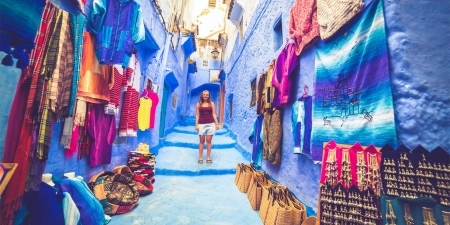 6 Nights accommodation with bed and breakfast in Casablanca, Fez and Marrakech. 3 nights accommodation on Half Board basis in Ouarzazate and Erfoud. 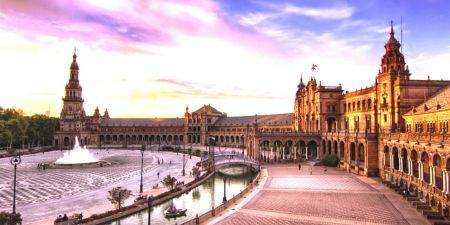 Local English-speaking guide in Imperial Cities (Rabat, Meknes, Fez and Marrakech). English driver during all the trip. Extra not mentioned in the itinerary. 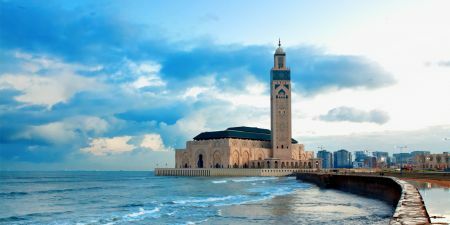 Hassan II Mosque – 15 USD per person. After having breakfast in your hotel, departure to Rabat. Once arrived, you will have a tour of the Royal city of Rabat including the Royal Mausoleum, Hassan tower, the ancient necropolis site of Chellah and the fortress of Ouddayas. After lunch (optional), departure to Meknes, visit the Royal Stables, Bab El Mansour and Jewish Quarter before to continue to Fez through the holy town of Moulay Idriss and the Roman Ruins of Volubilis. Overnight in Fez. After breakfast, start your guided city tour of Fez, once the capital of the kingdom before 1912. Your visit today will revolve around exploring Fez which is a World Heritage Site, according to the UNESCO, it was founded in the 9th century and it is home to the world's oldest university. Your local guide will show you around the major sites as of the Bou-Inania and Attarin Medersa, the tanners, Ess-Seffarine Square, Moulay Driss tomb, El-Nejjarine square, and the cabinet makers’ souk, the Hebrew district ‘Mellah’. In your schedule, you will visit a pottery factory so that you get to have a full insight about Fez culture. After (optional ) lunch at a local restaurant, you are free to either choose to go back to your hotel or stroll in the narrow alley of the old town on your own. Overnight in Fez. After breakfast, departure to the ocher city of Marrakesh through the high Mountains of the Middle Atlas, passing by Ifrane and the Berber village of Immouzer Kandar, on the road, you can enjoy several colonies of Macaque monkeys. Lunch (Optional) at Beni Mellal before to continue to Marrakesh. Overnight in Marrakesh. Today you will get the chance to wake up and live Marrakesh, a dream of many, so be sure to make the best of it. After your breakfast your local guide and driver guide will be waiting for you to start a guided city tour of the “Ochre City”. We will visit first in the morning the Majorelle Garden which was named after the French painter, Jacques Majorelle who dedicated a lot of effort and passion to this art piece. After Majorelle let’s continue after it to Menara and though the name in Arabic translates to “lighthouse”, it is actually a pavilion with a basin and a garden of orchards and olive groves. We will be heading afterwards to the Koutobia Mosque, Bahia Palace and through the Jewish quarter called Mallah. After (optional ) lunch at a local restaurant, finish your visit to Jamaa El Fnaa and by visiting the souks and handicrafts quarters. Overnight in Marrakesh. After breakfast at your hotel, we leave the hustle of the city behind and travel the rugged road to Ouarzazate through the spectacular scenery of the Atlas Mountains. After about 4.5 hours driving, stop in the Ksar of Ait Ben Haddou, which at a height of 1,160m, stands in stark contrast to this vast plateau. Originally a crossing point for traders crossing the Sahara Desert, this UNESCO world heritage site is equally recognized as the location for films such as "Laurence of Arabia" and "Gladiators". It is a striking example of southern Moroccan earthen architecture. Continue the driving to Ouarzazate after the visiting. Overnight at Ouarzazate. After breakfast, we will head to the entry to the Saharian dunes of Erg Chebbi; Erfoud. The driving will take about 6 hours. You will have some stops for visiting on the way. You will first stop in Kelaa Megouna, which is known for the production of cosmetic products using the extract of the local grown roses. Continue northeast to the city of Boumalne Dades to see the beautiful Kasbahs with a panoramic view of the Valley and the mountains beyond. We will continue afterwards to Todra Gorges, 300 meters high and one of the most impressive Moroccan sites, and one of the premier climbing and trekking destinations in Morocco with high walls offering hundreds of routes of sport and multi-pitch climbing. After the tour, head to Erfoud for overnight. Overnight in Erfoud. Get up early this morning to take the camel ride experience to witness the sun rising over the desert dunes of Erg Chebbi - one of Morocco's greatest sights, and perhaps the largest dunes in the Sahara, they are constantly shifting due to the considerable desert winds. After breakfast, drive to Skoura village via the road of thousand Kasbahs, stop at the beautiful Palmeraie and visit Ameghdil Kasbah dating from the 17th century. Return to Ouarzazate after the tour. Optional Excursion to Merzouga, Take the optional Adventure drive in 4-wheel vehicles across the barren and sand dunes to enjoy the sunset or the sunrise at a supplement charge of 65 USD per person (min of 2 persons). After breakfast, you will drive west through the High Atlas Mountains and the dramatic pass of Tizn Tichka en route to Marrakech. This hairpin road is one of only two passes through the largest mountain chain in Africa. After aroud 4 hours driving, you will arrive back to Marrakech in the afternoon and enjoy some free time to explore the city on your own. 12th and 26th of January 2019. 2 and 16th of February 2019. 2, 16th and 30th of March 2019. 13th and 27th of April 2019. 11th, 25th of May 2019. 1st and 22nd of June 2019. 6th, 20th of July 2019. 3rd, 17th and 31 of August 2019. 14th and 28 of September 2019. 12th and 26 of October 2019. 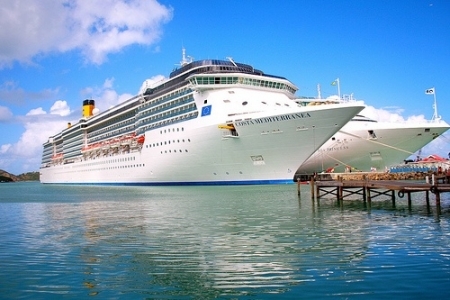 Price quotes are in US dollars per person per trip with minimum 2 Person and are valid until October 31st, 2019. Please inquire for pricing over Christmas, New Year’s, and Easter holidays.